Christianity probably came to Deeside in the fifth century when monks from a monastery at Whithorn in Wigtonshire travelled throughout Scotland. Later groups of missionaries came to the area from Northern Ireland and from Glasgow and after 400 years of work, by 900AD, Celtic Christianity was well established. By the 13th Century, the Roman Catholic Church practice had taken over and Celtic Christianity did not survive. New Churches were built but nothing remains of the old Celtic buildings. The Reformation in 1560 resulted once again in the destruction of the Churches all across Scotland, but in Braemar the changes took place slowly as Protestant Missionaries came to work in the Parish. Up until this time Braemar existed as two small villages one each side of the river Clunie. The Parish Church, known as the East Church was built in 1845 on a site opposite the Invercauld Hotel. The present Parish Church (known as the West Church) began life 1843 as a wooden building, to be replaced by a stone building in1845. It was built as the meeting place for the breakaway group which seceded from the Church of Scotland to form the Free Church in 1843. The root cause of the revolt against the established Church was the objection to a system of “Patronage” which allowed landowners or “Patrons” to appoint ministers without reference to members of the Congregation. In 1870 the present Church was built and the old building, having been demolished was taken stone by stone to be rebuilt and later used as a school in nearby Aberarder. Although disused this building still stands in Aberarder and gives a fine impression of the style of many of the original Free Church buildings. The inspiration for the building of the Church came from its minister, the Rev. Hugh Cobban who died in 1870, just days before the Church was opened. His grave, unusually, lies inside the church, just behind the pulpit. In 1929 there was a Union between the Free Church and the Church of Scotland and after much discussion the two Churches in Braemar united. It was however not until 1938 that a proper union took place and it took until 1945 for the decision to be made to confine services to be one building. 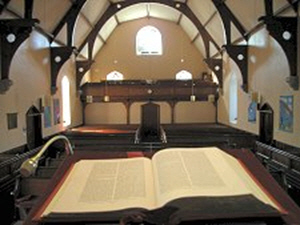 The Old Parish Church (the East Church) was eventually sold in 1948 and has been renovated to create housing. When the Church was built in 1870, the design reflected a return to an earlier era of church architecture in the spirit of Gothic revival. This was a reaction to the plain “barn like” structures which were typical of earlier church buildings. Such was the character of the new church that it inspired the minister of Crathie to advocate doing likewise, and with the help of Queen Victoria, the church there was demolished and rebuilt in1895. Braemar church is built in the shape of a cross with a very prominent pulpit which reflects the significance of the preaching of the word by its founders. As a Free Church it was without any musical instrument and the singing would have been led by a precentor standing in front of the Pulpit. Today we use an Allen Digital computer Organ. The communion Table is made of oak and came from the original Parish or East Church. The Font bears the inscription “One Lord, One Faith, One Baptism”. In the Apse are four lancet shaped stained glass windows which each contain a medallion which illustrates a text, lilies, a branch with fruit, a tree with palms. Our small Sunday school gives visitors an immediate welcome with some of their work brightening up the vestibule area. In recent years, a number of banners have been added, which some have described as “living pictures”. The stories they tell, the pictures they portray, and the words of Scripture they declare, are a reminder that the Word of God is still able to excite a new generation with the truths which inspired their forefathers.